The striking art glass backsplash above the gas range is the focal point of this kitchen remodel. On the owner's wish list for this kitchen remodel, was an extra large double sink and kitchen cabinets with glass doors. This family of four loves their kitchen island. It's where they have breakfast before school or work, snacks after sports as well as quick dinners on busy weeknights. This family's kitchen renovation involved enlarging the opening from the kitchen to the dining room and incorporating an island. 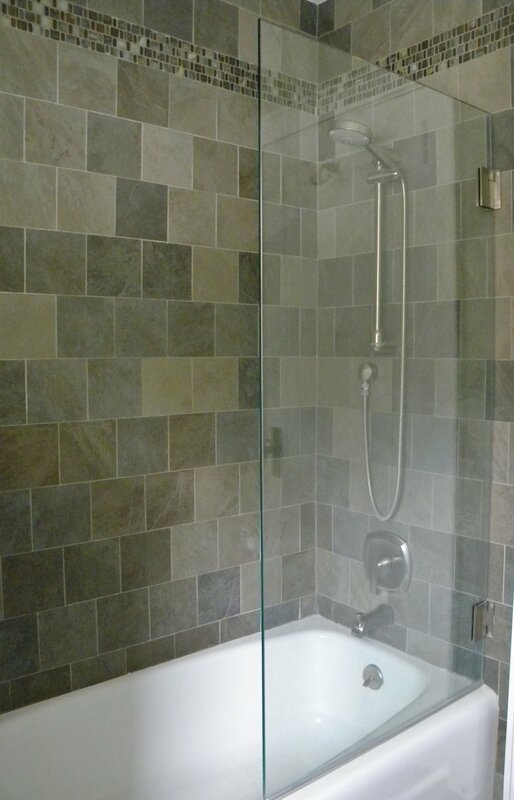 The operable glass panel keeps the water from the rest of the bathroom while giving it a more spacious, open feel. The vanity with six drawers provides plenty of storage in this bathroom remodel.